Posts related to TripleClicks store issues. buying, paying and others. 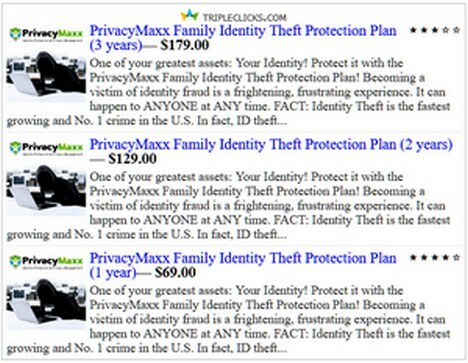 In the event of ID theft, you’ll get direct access to a PrivacyMaxx professional recovery advocate, who will manage the entire recovery process for you and your family. In addition to handling the follow-up, paperwork, and phone calls for you to recover your name and credit history, your advocate will document, dispute and reverse all fraudulent transactions for all known types of identity theft. As an added layer of protection, you’ll also get Internet Monitoring follow-up once you are back to pre-theft status. Consider making EA 3 months and aggressively work on pre-registering Merchants. I consider this is a great opportunity. The program is groundbreaking. Affiliates will earn VPs buying to Localvantia Local Merchants in their cities. In your city, those merchants you pre-registered that become registered. All affiliates in your country will earn VPs by buying in local stores registered with Localvantia. For each VersaPoint dispensed by your merchants, you’ll earn one Bonus VP! Imagine you’ve signed up a popular restaurant or grocery store that SFI affiliates shop at, who earn themselves 50,000 VP a month from their purchases there. That’s 50,000 Bonus VP (shares of the TripleClicks Executive Pool +- $18) for you each month, essentially just for introducing the merchant to the Localvantia program. And that’s just for ONE merchant; you could have lots more merchants! Localvantia This is a great NEW SFI Business Opportunity. You pre-register local businesses, if they register with the program you will earn VPs from the sales activity. If for example you pre-register a supermarket or any other store or service providers you will get 1:1 the VPs affiliates earn buying and using the participating businesses, stores(drug stores,anything) or services providers (lawyers offices, Laundromats)you get the same amount of VPs. In addition to using them yourself and earning VPs from your purchases. Learn more about it ( https://news.sfimg.com/2017/06/29/localvantia-excitement/ ). I see it as a very good program to build residual streaming VPs earnings which you cash from the Triple Clicks Executive Pool shares. Now I can tell you that if you behave as a enterprenur and build up a big group of local merchants registerd as Localvantia merchants the SFI affiliates purchases in this stores will produce a streaming income. Specially in countries like Nigeria, Serbia and others that have big and growing base of active SFI affiliates. Check out the latest on Localvantia And don’t forget that ///// pre-registrations are a “first-mover advantage” opportunity. ///// Need to pre-register local merchant fast so other affiliates don’t get them first. PRE-REGISTER FORM HERE ( https://www.sfimg.com/MyAccount/lv_prereg ) That is, If you’re not pre-registering your local merchants, if you’re letting other affiliates do it instead, you’re potentially forfeiting hundreds of dollars in monthly residual income that could be YOURS. What are you waiting for? Get your share! If I understand correctly , we do not approach the merchant during prelaunch? Wait until launch to contact the merchants we have submitted? Hi Willie, Yes, that is correct. Get your merchants “listed” now by pre-registering them now. PRE-REGISTER FORM HERE ( https://www.sfimg.com/MyAccount/lv_prereg ) Then, when we go live to the public with Localvantia in the fall, follow-up with your listed merchants to get as many officially signed up as possible. There will a variety of aids and lots of training made available to make this task simple and even fun. And all your fellow local affiliates can actually participate in the follow-up too to make the job even easier (more on this later). The ECA Program allows existing businesses to sell their products through the Tripleclicks marketplace. E-Commerce associates benefit not only through access to an existing online presence and platform, but through the efforts of more than 75,000 SFI affiliates who will market the products.